The Eveready #2697 Official Boy Scout Flashlight. Introduced in 1927, it was the first outdoor flashlight sold in the United States. Although kerosene lanterns and candle lanterns are perfectly adequate for most of my camp needs, there are times when I need a truly bright, focused beam of light. That’s when a flashlight is indispensable. I’m not talking about the modern super tech lights but flashlights that were created for genuine field use in the early to mid-20th century. 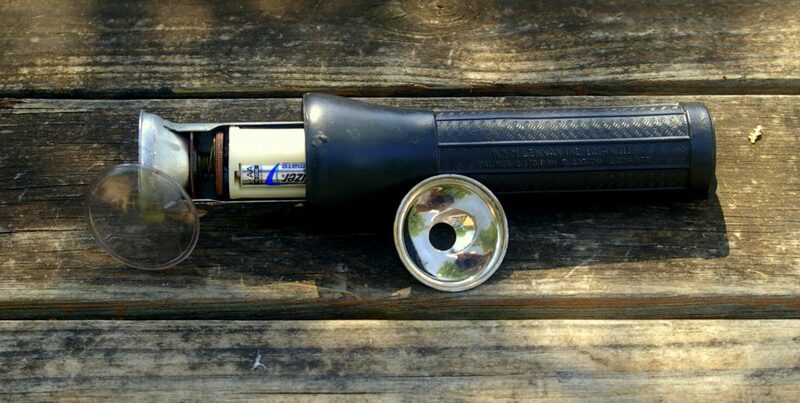 If you plan to replicate classic camping circa 1880-1920, then a flashlight might not fit in. While they were introduced in the late 19th century, batteries were too short lived and flashlights were not weatherproof enough field use. Otherwise, having a flashlight in camp can come in handy and it is clear that they were being used in traditional camps during the pre-WWII period. Conrad Hubert, a Russian immigrant (real name Akiba Horowitz) living in New York, owned and operated the American Electrical Novelty & Manufacturing Company, a firm that manufactured various small electrical products such as small portable fans, pocket lanterns and the like. Hubert became interested in the electrical inventions of David Misell, an English expatriate living in New York City. Misell had invented numerous electrical devices including a small hand held lamp, a bicycle head lamp, a handheld device for lighting natural gas burning equipment and a handheld light, which he patented in 1898. Conrad Hubert introduced the first dependable flashlight in 1898 under the name Ever Ready. 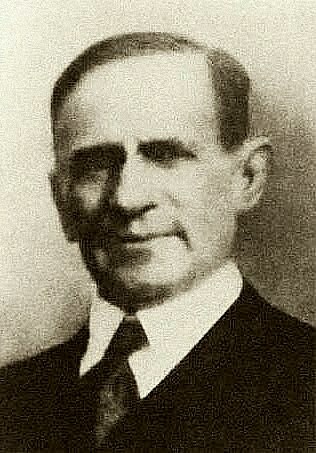 Hubert hired the inventor to improve his company’s existing products and to develop new ones. When he learned of Misell’s handheld light, Hubert immediately recognized its potential and decided to focus on developing it. 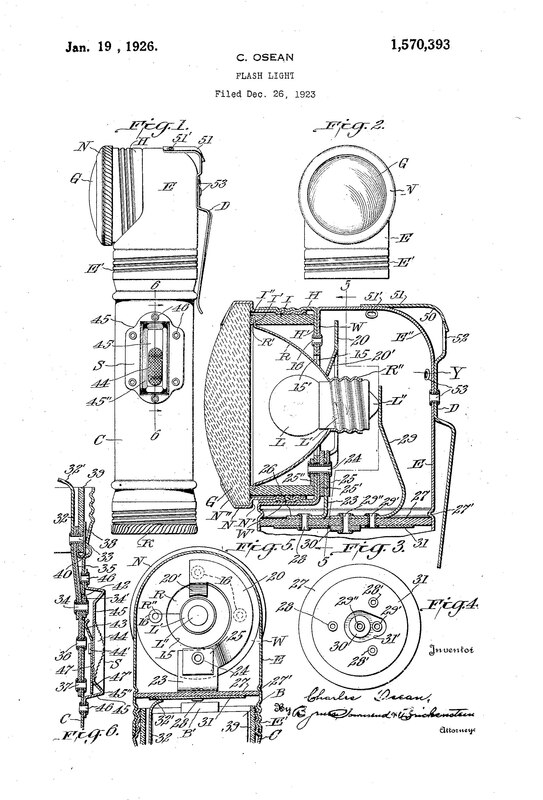 Both men, as partners and individually, patented several flashlight designs before Misell sold his patents to Hubert, who introduced the world’s first dependable flashlight in 1899. 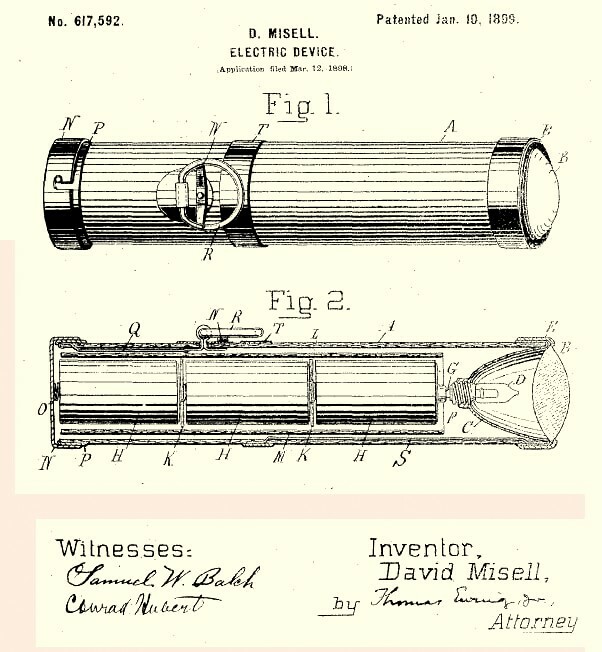 David Misell’s first flashlight patent while employed by Conrad Hubert’s American Electrical Novelty & Manufacturing Company (Patent No. 617,592). Of course the flashlight would not have been possible without the invention of the storage battery. At the time, nearly all product development, manufacturing and marketing of batteries was conducted by the National Carbon Company. National Carbon marketed the very first dry cell battery (the type we think of as a battery today) for consumer use in 1896 and the first dry cell flashlight battery in 1898. That battery continues to be produced today in the same form, dimensions and power parameters as the “D-cell” battery. The firm also supplied the materials required to manufacture batteries to the American Ever-Ready Company, who made batteries under their own label to complement their flashlights. Ever-Ready battery sales outpaced flashlight production enough that Hubert changed the company name to the Ever Ready Battery Company. In 1906, National Carbon bought s half interest in the Ever Ready Battery Company. The business name was changed again to The American Ever Ready Company and the trademark was shortened to simply Eveready. Most of these early lights featured tubular cases of celluloid fitted with a brass reflector and glass lens on one end and a steel battery cap on the other. 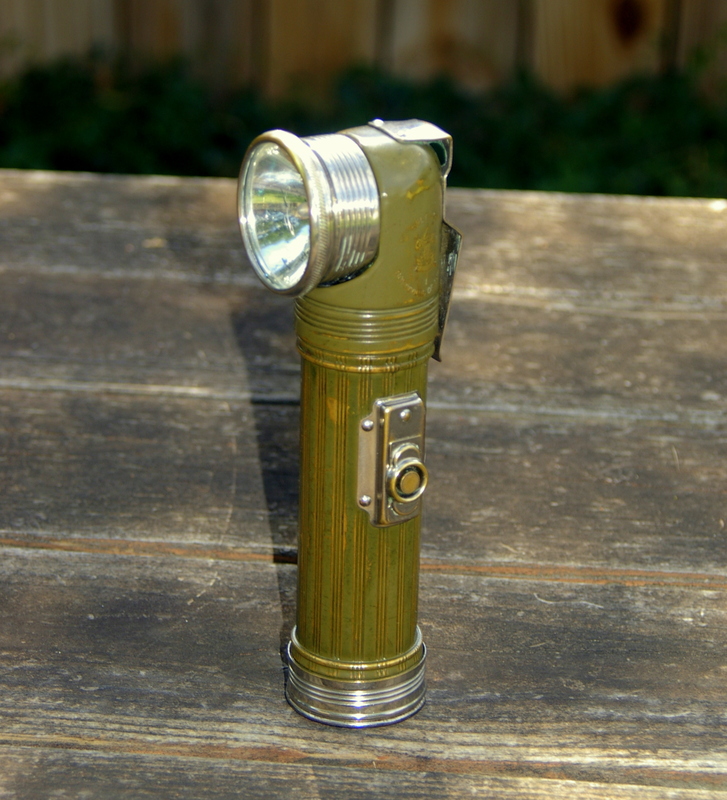 In addition to tubular flashlights, vest pocket lights were also popular. These were shaped like a Prince Albert tobacco can with a lens mounted at the center of one end. Flashlight bulbs were made using very thick carbon filaments, which were required to survive the jolting associated with carrying a portable light. Unfortunately, the batteries of the day did not produce enough power to overcome the resistance of the thick filaments for very long. If the flashlight was used continuously for even a short length of time it would become uncomfortably hot to hold and the batteries would quickly die. The device was nicknamed flashlight because the only way to maximize battery life and avoid overheating was to turn the light on for a second or two at a time to produce a “flash” of light. The first great leap in flashlight technology was the advent of tungsten bulb filaments in 1910. The new substance made it possible to produce filaments that were smaller in diameter and far more durable, meaning bulbs burned brighter and batteries lasted longer. Around the same time, the familiar push button switch appeared. By 1912, flashlights were cased in tubes of either hard vulcanite rubber tubes or nickel plated brass. Around 1914, box lanterns entered the market. Box lanterns were small rectangular affairs with a standard tubular style flashlight lens mounted at the top center of one side. One end featured a bail to allow the user to hang it around the neck or from a nail or branch. These box lanterns were often shown being used outdoors in product advertising, particularly in Boy’s Life, the official magazine of the BSA. The heyday of the box lantern style light ended around 1921 when this style of light virtually disappeared from the market. 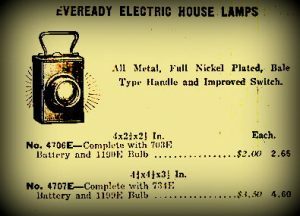 Beginning in 1921, Eveready introduced a line of new nickel plated tubular flashlights including the Model #2674 3-cell “spotlight” with a 300 ft. range. The new light was heavily promoted for use outdoors. “An Eveready is as necessary as a camp axe”! In 1927, Eveready marketed the first purpose-built outdoor flashlight with the introduction of the Model #2697 Official Boy Scout Flashlight. The #2697 was very similar to the #2694 industrial flashlight and featured the same right-angle head, the “safety lock” switch and the hanging ring of that model. 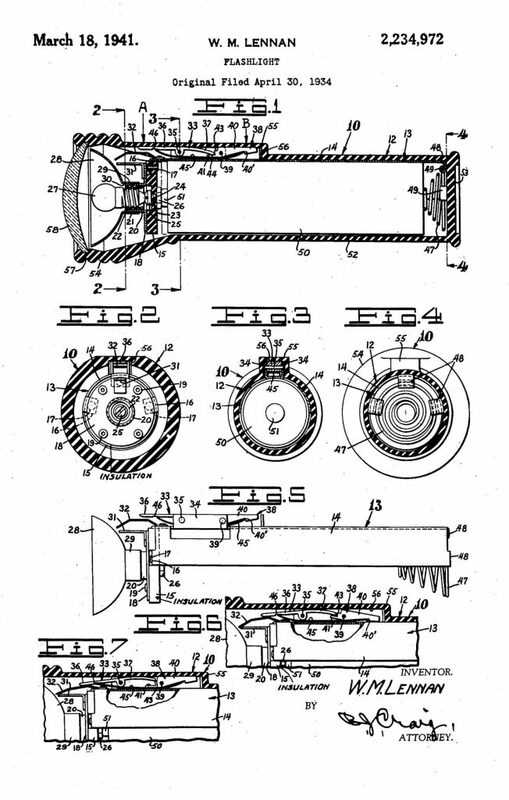 The Eveready #2697 Official Boy Scout Flashlight patent. This model was the first outdoor flashlight on the market. The new Boy Scout light featured an olive/khaki painted case with elaborate detailing, contrasting with a bright nickel plated lens, battery cap, belt clip and switch. The angled head, like the battery compartment, was made from brass sheet. The head was essentially hollow, sealed at both ends with brass plates riveted in place. This type of construction resulted in a relatively lightweight light but the hollow head was subject to denting. The belt clip was attached to the head at the top and the back with rivets. Like nearly all flashlights of the period, the #2697 used the #14 2.74 volt, 0.741 watt miniature bulb with the E10 screw base. These bulbs were very dim by today’s standards. The lens surround featured a screw-adjustable focus to produce a diffused beam or a spotlight beam and everything in between. Oddly, the glass lens could not be changed if broken as it and the lens surround were permanently connected. The #2697 was no brighter, more dependable or weatherproof than ordinary household flashlights but the right-angle-head, safety lock switch, adjustable focus lens and belt clip made it ideal for outdoor use. The #2697 flashlight became the model for what an outdoor flashlight “looked like” for decades thereafter. United States military forces were using flashlights before America’s entrance into World War 1. At the time, flashlights were the responsibility of the Signal Corp. Manual No. 3, Technical Equipment of the Signal Corp (1916) listed a 2 cell Ever Ready flashlight as standard equipment. By the 1920’s the US Army Air Corp procured the Type A-1, 2-cell tubular flashlight. However, all of the military flashlights used during World War 1 and most of the interwar years were issued for signaling or inspection purposes. As this article is about outdoor/field flashlights, we are interested in the kind that are built to be rugged enough to withstand daily outdoor use such as Army soldier would carry. 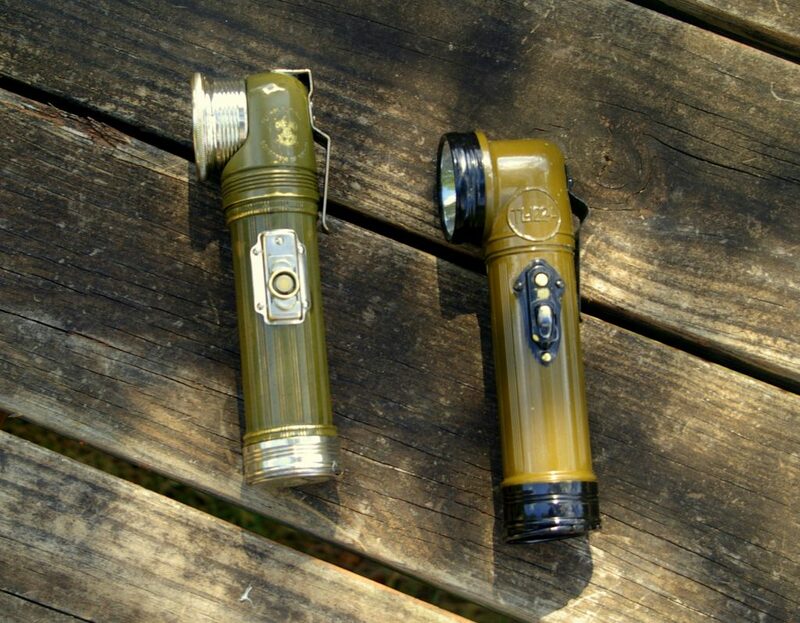 And those did not exist until the late 1930’s when the US Army issued the TL-122 flashlight, a militarized version of the Eveready #2697 Boy Scout light. The TL-122 was the first in a long line of military angle-head flashlights that continue to this day. The TL-122 used the same case as the #2697 with the “TL-122” designation stamped into the head instead of the BSA emblem. The light was painted Army olive drab and the lens, switch and battery caps were finished in black. The innards were unchanged as the TL-122 used the same #14 screw-base bulb. Because the TL-122 was derived from the #2697 it featured the same screw-adjustable focus and odd lens construction that meant the glass lens could not be changed if broken, not a particularly good attribute for a light that might be subjected to battlefield abuse. As the TL-122 was issued for a very short period they are relatively rare today. In 1939 Eveready introduced an updated Boy Scout flashlight, the Model #8257, fitted with the newly developed PR9 2.7 volt, 0.41 watt, flange-base bulb. This bulb was brighter than the older #14 flashlight lamp. The case of the #8257 was less decorative than before and had a more functional appearance. The head was crafted from cast aluminum instead of thin brass for greater durability. The new head design was shorter by a half inch over the previous model. The light was fitted with a more contoured belt clip mounted only at the back of the head. The case was painted olive/khaki and featured nickel plated lens and battery caps, switch and belt clip. The switch was also new and now featured a push button signaling switch. As before, the BSA emblem was stamped on the head. The lens surround was now redesigned so that a broken lens could be replaced. The #8257 also eliminated the screw-adjustable focus of the previous model. Instead, it featured a fixed focus spotlight beam. 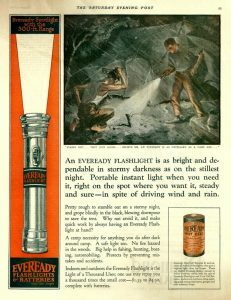 At the same time, Eveready introduced the “civilian” #2257 flashlight that was virtually identical to the Boy Scout light. It was finished in olive green with black lens and battery caps, switch and belt clip. The #2257 was quickly adopted by the US Army as the revised TL-122A, first issued to troops sometime around 1941. The new TL-122A was the first to place the model designation stamping inside a circle, a feature that was used on all later variants. The TL-122 was fitted with a large rubber O-ring seal in the battery cap to improve water resistance in that area. In all other respects it was identical to the #2257. Once America entered the war, TL-122A production was contracted to additional firms to ensure that demand for the light could be met. These firms also produced a fair number of Boy Scout flashlights as well. Although the TL-122A can be seen in many WWII photos, it was no longer is use by 1944 as it was replaced by the plastic cased TL-122 variants. Good surviving examples of this light are uncommon today. The TL-122A military flashlight (replica) compared to the Eveready #2697/TL-122. 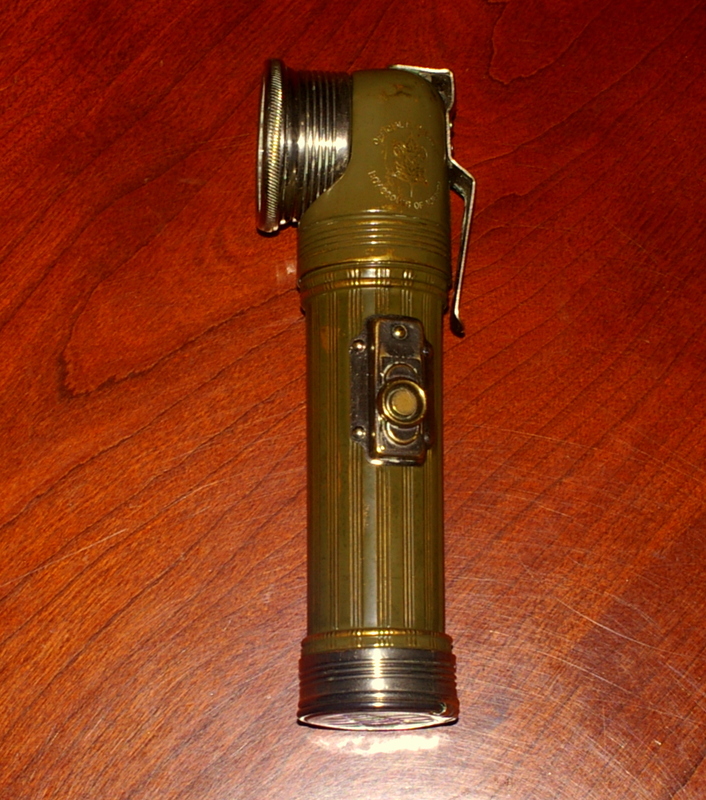 The TL-122A was a military version of the second generation Boy Scout flashlight, the #8257, introduced in 1939. The cases of subsequent TL-122 variants (TL-122B, C and D) were made from thick plastic that was much more rugged than the earlier lights. The later models featured an extended battery cap to hold spare bulbs. Because of complaints that the cases of the TL-122B smelled and gave off a waxy residue, it was quickly replaced by the TL-122C, which featured a sealed lens, battery cap and switch for near waterproofness. The TL-122C is the most commonly found military flashlight from World War II. The last variant, the TL-122D, added an extended shroud around the lens to hold various lens filters. That model was never issued during wartime. Today’s military flashlights are most similar to the TL-122D. The plastic bodied variants did not go unnoticed by outdoor enthusiasts. Calvin Rutstrum recommended TL-122B and C style flashlights in his book Way of the Wilderness (1946, Burgess Publishing Company, Minneapolis, MN). Though the light illustrated in the book is not described as a military model, it is certainly a TL-122B or C model. Rutstrum even mentioned that he carried spare bulbs in the battery cap and that recent models had the advantage of being waterproof. Aside from the angle head family of lights, no other vintage outdoor flashlights existed (that I am aware of) until the introduction of the Rub-R-Lite, manufactured by William M. Lennan, Inc. of Los Angeles, CA. 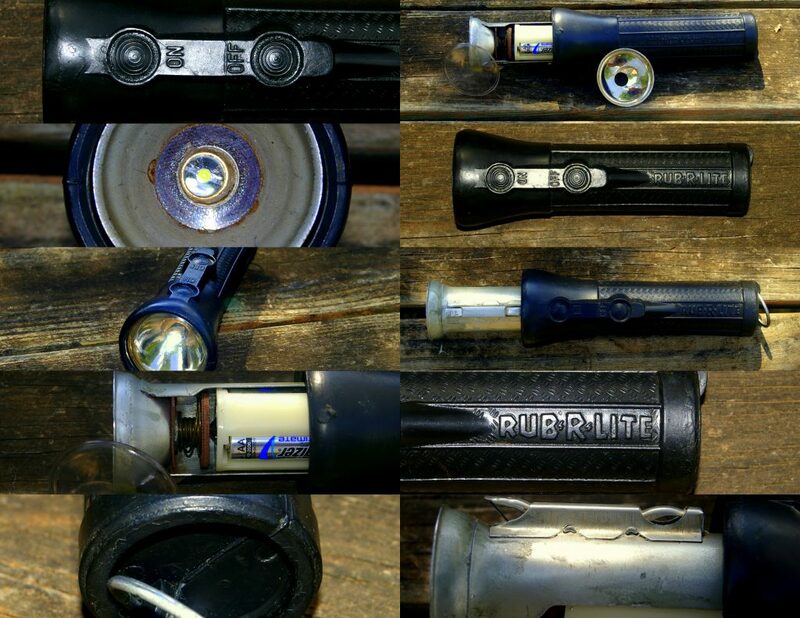 The revolutionary feature of the Rub-R-Lite was the seamless rubber casing that made the flashlight virtually waterproof and more damage proof than any light then available. William Lennan had been interested for years in developing a water resistant flashlight. He applied for a patent of a rubber encased; water resistant flashlight as early as 1934, with patents granted in 1936 and 1939. However, no product was produced as Lennan continued to modify and improve the design. The final design of the Rub-R-Lite was patented on March 18, 1941 (2,234,972) and entered the market in 1943. On August 3, 1944, the light was approved and certified for use in mines by the US Mine Safety and Health Administration (Approval No. 0C-610). In the lighting department, the Rub-R-Lite was decidedly non-revolutionary as it continued to use the common #14 screw-base bulb. However, it did feature an adjustable focus. This was accomplished by means of an internal focusing wheel. By turning the wheel clockwise or counterclockwise, the bulb was moved forward or backward in relationship to the reflector, which changed the focus from a diffused to focused spotlight. The light featured an internal chassis of lightweight steel that contained the lens reflector, bulb, focusing wheel, switch and batteries. This chassis was encased within a seamless, natural black rubber housing. The switch could be operated by pressing on the housing, where on/off finger positions were located. To replace the batteries/bulb, or to adjust the focusing wheel, the lens was removed from the housing by gently prying the rim of the housing away at the edge. The lens, which was seated in a groove molded into the rubber, popped out of the housing. The reflector was then removed and the entire chassis was ejected from the housing by sharply shaking the flashlight, bulb end down, until the chassis slid partway out of the rubber where it could be pulled the rest of the way out of the housing. The Rub-R-Lite internals removed from the rubber casing. While Rub-R-Lite brightness/beam was no match for military flashlights fitted with PR9 bulbs and fixed spotlight focus, it was the first light available to the general public that could be used confidently outdoors in all kinds of weather. To round out my camp lighting selection I desired an outdoor flashlight produced during the traditional camping era. Because I happen to be impatient, I didn’t want to wait to find a suitable original. With that in mind, my first purchase was the replica TL-122A from What Price Glory. This light is a close copy of a genuine Tl-122A with a few very slight changes. The light lacks the O-ring seal on the battery cap, which is stamped with the letters WPG instead of the original manufacturer’s trademark, the belt clip lacks the oval hole of the original and the rivets attaching the switch to the case are of copper instead of the brass or steel. The WPG replica is fitted with an incandescent PR9 flashlight bulb just like the original. The fixed focus reflector is superb. The light throws a sharply defined beam of light, though with the old style bulb, that beam is relatively dim. The case is made from brass sheet and the head of cast aluminum. Fit and finish are excellent. The replica is painted Army olive green with black painted lens surround, battery cap, switch and ring – just like the original. Because the replica uses a Pr9 bulb it is easily upgraded to the superb KT-LB 3 volt LED bulb rated at 30 lumens. This bulb is very inexpensive and is widely available. For long lasting performance, even in cold conditions, I replaced the standard alkaline D-cell batteries with AA-cell Energizer Ultimate Lithium batteries. This was accomplished by using a pair of parallel battery adapters. These adapters use three AA-cell batteries to match the voltage of one D-cell. This setup is much lighter than using the original size batteries. The pre-focused beam of the flashlight, upgraded to the LED bulb, produces a bright, sharply defied beam of light. Of course, the upgraded flashlight is nowhere near as bright as the tactical LED super lights of today but I didn’t need or want it to be. Just a couple of years later I happened upon an original Eveready #2697 Official Boy Scout Flashlight in good condition. It required some cleaning up but now works like new. Of course, because it is an original, the #2697 was fitted with the very dim #14 screw-base bulb. Sadly, there are very few LED upgrade lamps for this type. I found the #222 E10 LED bulb (1.5-3v – 6 AA-cell or 2 D-cell batteries, 50 lumens). This bulb uses a plastic bulb cover that looks somewhat like an original #14 bulb behind the light lens. Though the bulb does not seem as bright as the TL-122A replica, most likely because of the difference in the reflector, it is much better than the original incandescent bulb. 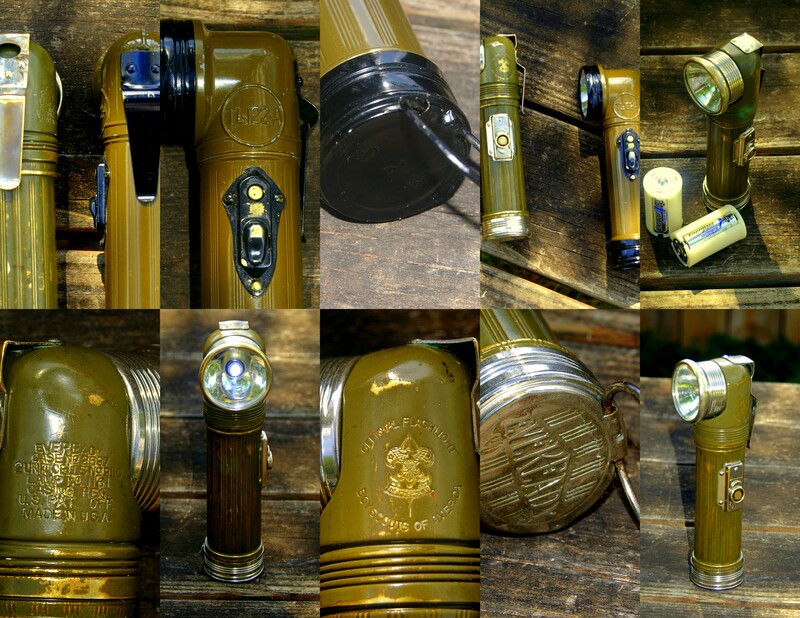 In terms of old time traditional camp beauty, this flashlight beats them all. Boy Scout Flashlight and TL-122A flashlight. I recently added another flashlight to my collection – a Lennan Rub-R-Lite. The example I found was in remarkable condition. The rubber case is undamaged and looks new. The metal reflector is in very good condition. The lens, though a bit hazy in the center, is mostly clear and not cracked or broken. Again, I upgraded the batteries and bulb. For the bulb upgrade I selected an NL340 lamp (1.5v-9v, 2 – 6 AA-cell or 2 D-cell batteries, 0.5 watts power, 50 lumens) sold by Reflectalite in the UK. All in all, it is a very rare example of the first American-made waterproof flashlight. My Lennan Rub-R-Lite. A near perfect example. I suspect that folks would like an idea of how the lighting performance of these three lights compare. Absolutely the brightest, sharpest beam is produced by the What Price Glory TL-122 replica. That’s because – 1) the fixed reflector of the Army light is so good, 2) the reflector of this newly produced light is also new and is as polished and reflective as possible, and 3) the bright KT-LB 3 bulb. This light is the most powerful vintage style flashlight you can buy. It is too bad than a modified version with vintage Boy Scout markings is not produced. The original Eveready #2697 Official Boy Scout Flashlight comes in second. The old style screw-adjustable focus never achieves the sharp spotlight beam of the TL-122 replica. Being a roughly 90 year old light, the reflector just does not compare to the new one used in the replica, even with the brighter LED bulb upgrade. However, it is certainly an adequate light and is the most beautiful of the lot in my opinion. The 1940’s era Rub-R-Lite comes in a dismal third. I thought this light would be GREAT but the lighting performance is far below the other two lights in my collection. Again, the old reflector does not do its job like a new one. The 50 lumen bulb is very bright and is not at fault. The old lens is somewhat hazy and that is certainly a contributor (I plan to polish the haze out at some point). It seems to me that the real culprit is the focus or lack thereof. I have attempted to adjust the focusing wheel in both directions and while the bulb does move forward and backward in relation to the reflector, the best the light can do is produce a very diffused beam. Still, it is a truly unique, rare vintage camp light. So there you have it. If you would like to add a vintage flashlight to your kit, you might want to consider one of the models I’ve tested here. Here’s to brighter nights ahead!